Sand River Masai Mara, part of the Elewana Collection, overlooks the river from which it takes its name. It's located in a game rich area of natural beauty close to the border with Tanzania. If you want to stay in luxurious surroundings then Sand River could be the one for you. There are 16 tents in total, these are split between two adjacent camps each with their own main areas. One has 10 tents and the other 6. The tents are beautifully decorated in an elegant style, paying homage to the luxury camping safaris of the 1920s. The interior design is immaculate, elegant and beautiful. Attention to detail is evident at every turn, from the beautiful rivetted copper bath, down to the cut glass sherry decanter and glasses found in each tent. The beautifully crafted antique furniture, Persian rugs and natural colour pallette make the tents a haven for peace and relaxing. The outdoor viewing deck is an extension of this. Overlooking the river, it's an ideal spot for an armchair safari, as you watch the world go by. Each main area has a traditional mess tent. This is where delicious evening meals are served, the individual tables elegantly laid with white linen, silverware and candles for a romantic ambience. Breakfast and lunch often take place al-fresco. You will also find a comfortable lounge here with large sofas, various secluded seating spots and a host of interesting books dotted around. To the fore is the swimming pool which also overlooks the river, and perhaps most surprising, there is also a billiard table but it fits perfectly with the 1920s era. Open: Sand River Masai Mara is open all year. Location: The camp is located within the Masai Mara Reserve on the banks of Sand River. It's close to the border with Tanzania. Rooms: There are 16 luxury tents divided between two camps. One has 6 tents, the other 10. The tents are spacious, en-suite with both bathtub and shower. There is one family tent with a double and a twin room, each en-suite. The private decks overlook the river. Activities: This camp is all about seeing the wildlife and wilderness of the Masai Mara. You will be able to take game drives. In addition, you could enjoy bush lunches and dinners under the stars. You may opt to see the Mara from a different angle and take a hot air balloon trip (extra). You can enjoy sundowners at specially chosen locations. Facilities: Each camp has a lounge, library and dining area. You will find a selection of board games in the lounge too. There's a swimming pool for those hot afternoons. The camp provides a laundry service. Children: Children of all ages are welcome, though no baby-sitting services are available. Health: This is a malarial area. Communication: WiFi is available in the main areas of the camps. We know and love Kenya, and would be delighted to help you plan your perfect trip here. Let us help you plan your perfect tailor-made holiday to Kenya. Talk to one of our travel experts. Tell us what you want, and we will tailor make your perfect trip. 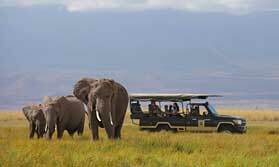 This is a fantastic safari, a real trip of a lifetime. Stay in gorgeous lodges and safari camps and go on game drives in some of the best wildlife viewing spots in Kenya. Sand River Masai Mara has been awarded the Silver-level Eco-rating Certificate by Ecotourism Kenya in recognition of its high level of environmental responsibility and its dedication to the support and integration of local communities.